Until now, many people thought a 45 Gallon Drum only had a handful of uses, from BBQ’s to waste storage. 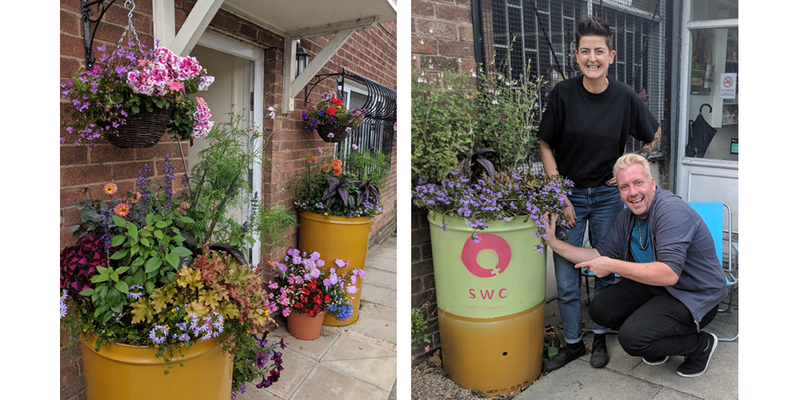 Two great charities across the North West have turned some of our barrels into beautiful planters to spruce up their HQ. The RHS (Royal Horticultural Society) is the world’s leading gardening charity. Providing funding to causes and projects that help the community flourish. Andrew Simpson (above) is the RHS Community outreach advisor, helping charities across the North West with community projects. The picture on the right shows Andrew with Holly, outside the Salford Women’s Centre, which is a safe space for women in Salford. They’re an independent charity organisation providing women’s only services and support. The picture on the left shows 2 of our barrels being used as planters outside Kenyon Residents Association, who do a lot of work in their local community like putting on free cooking sessions and street activities in the summer for the children. Both charities have been supported by the RHS and have put the drums to some great uses. We love seeing the creative, unconventional ways people use our drums. Why not try this our for yourself? Our incinerator drums are perfect as they have holes pre-drilled which make for a great drainage system – from as little as £19.44!